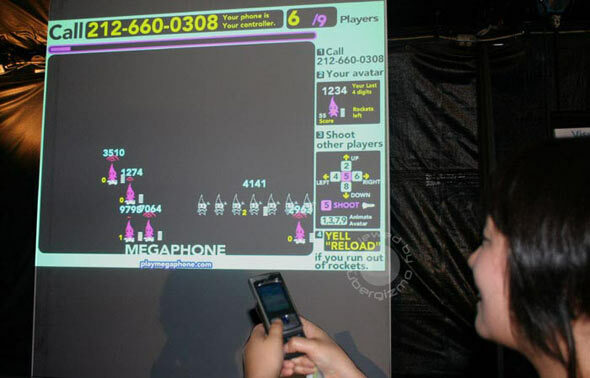 "MEGAPHONE3001" is a multiplayer real-time collaborative telephony platform for use on large screens in public space such as sports arenas and concert venues, and movie theaters. It isn't a mobile application, but a phone system that users can call into. The phone system reacts to buttons and voice to control a screen near the user. 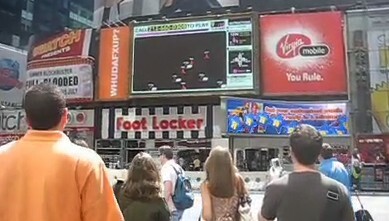 It can be used for information, advertising, and is currently setup as a series of games. The user simply has to call the phone number displayed on top of the screen (see photo) and his avatar will appear immediately on the screen. Imagine that you're walking down the street one day and come across a giant screen where little triangular avatars are blasting one another à la Battle Tank. On the sidewalk are cheering men, posh women, grannies and kids, all clutching their cell phones and staring at the screen. If the MegaPhone project gathers any steam, such a diverse group of gladiators might be a reality. Designed by Jury Hahn from New York University for Yahoo Design Week, the concept behind MegaPhone is simple. ANY phone on ANY carrier in ANY country can dial the number that appears at the top of a public game screen and — presto! — you've turned your cell phone into a game controller. 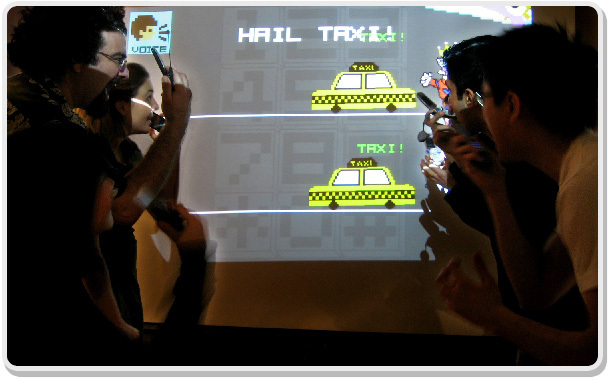 There's no software to download, and Megaphone also allows for voice control to perform such actions as reloading, ordering your avatar to devour pellets onscreen, or hailing a taxi. The goal of MEGAPHONE3001 is to make available an entertaining way to control a big screen in a public space. This is a good way to make idle time valuable (like at theme parks or concert venues) and create ad hoc social connections.